The Milwaukee Bucks won their preseason opener, 93-88 over the Chicago Bulls in La Crosse. Andrew Bogut scored 14 points and Charlie Bell added 13 to lead the Bucks. 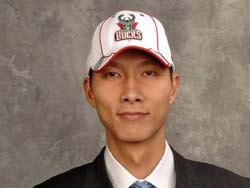 Top draft pick Yi JianLian (pictured) scored just 4 points in his debut. He fouled out in just 16 minutes. Yi entered the game to a huge ovation with 59 seconds left in the first quarter but quickly picked up three fouls and went to the bench midway through the second quarter. The Bulls top pick, Joakim Noah, finished with six points, four assists and four ebounds in 23 minutes. The Bucks returned to La Crosse for the first time since the 1999 season and were greeted by a sellout crowd of 6,118 fans at the La Crosse Center.